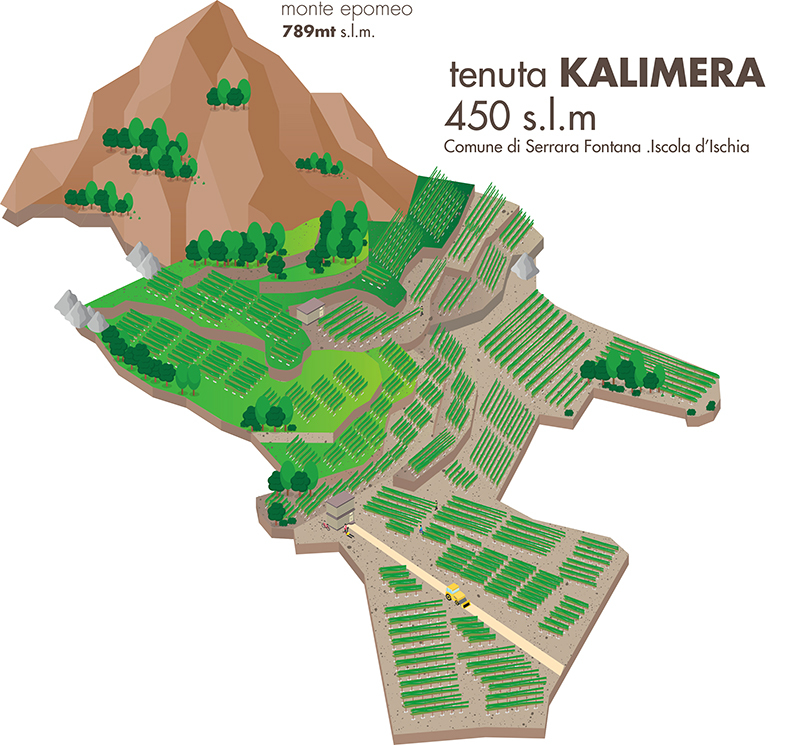 Most of Ischia’s winegrowing is represented by mountain viticulture. Grapes have long been present here, from the coastline, just a few metres above sea level, to altitudes of over 600 metres and, naturally, the ideal vineyards are those on narrow terraces, with the best possible exposure to sunlight. This is the cultural and environmental setting of what has been defined as heroic viticulture: only a very small part of nearly all viticultural activities can be mechanized here, so a true contemporary hero (the winegrower) must step in, forced to work four times as long as his peers in the plains. The outcome of this convergence of distinctive elements has been translated today into the conservation of a number of unique and rare varieties that have adapted to this habitat over the centuries, yielding wines that would be difficult to reproduce elsewhere. Following this extraordinary tradition of actively protecting biodiversity, in our vineyards we are inspired by the principles of biodynamic agriculture to treat the soil. The careful use of field preparations (horn manure and horn silica) allows us to avoid using chemical compounds that would alter the original nature of the soil and plants. When necessary, we use green manure and practice spontaneous turfing controlled strictly with mechanical means. Furthermore, to defend against fungal diseases, we use only copper and sulphur, which are not absorbed by the grapevines.